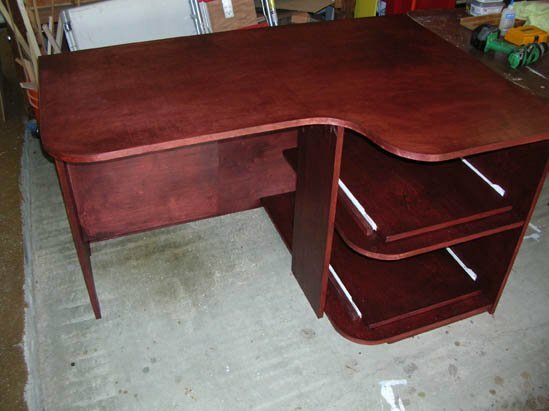 A friend of mine needed a plywood corner desk that can hold his older style computer and two printers. He had a location picked out in his home office. That proved to be a helpful thing because it gave me specific sizes to work with. For instance, the computer is a given size, has chords coming out the back, and he wants it off the floor to provide more feet room under the desk. The desk will fit between a wall on one side and a door on the other, so it could only be so long. He first thought he wanted the desk to be higher than the standard 30 inches, but decided against it when he realized all his chairs are set for 30. He needs all the topside space he can get and with this custom build, we were able to get the printers off the top and stowed underneath. My friend's printers feed out the top, as with most desktop printers, so we build two sliding trays for them. The trick here was to keep the slides long enough to fully expose the printers. We had just enough room for this, given his office sizing restrictions. When you build yours, be sure to check for all rolling clearances before hand. We have a laser printer wedged in our office awaiting a redesigned cabinet—that's how we know. 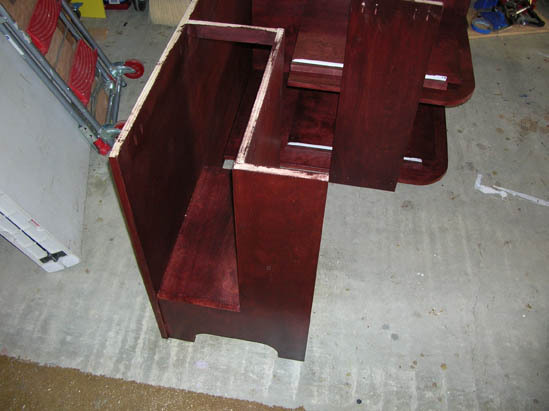 The photos here show this plywood corner desk in pieces, sitting on the garage, uh, shop floor. My friend wanted it stained so we did it. Plywood doesn't stain consistently over a large surface and it came up blotchy despite our best efforts. Once the equipment is on it, I doubt it will show, but you should take that into account when building yours. We used 3/4-inch birch plywood for strength and consistency throughout. This plywood corner desk is too big as a complete unit to fit through a door, so we build it in three parts. The top and two side pods were test-fit at the shop before delivery. We used pocket hole joinery throughout this project and once assembled, you have to look real hard to find any joining hardware. We did not cut any holes in the top or back for chord pass-through until we got the desk delivered. That way we could located them close to power outlets, etc. 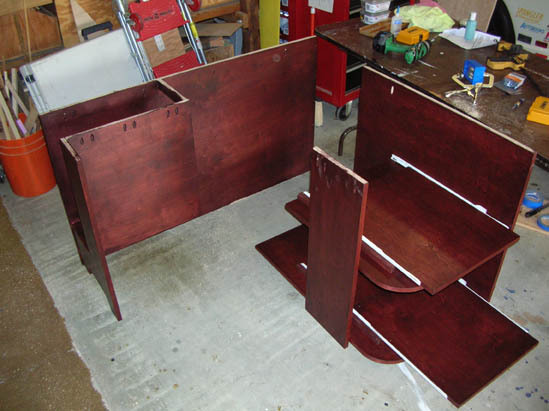 There are three coats of urethane over the stain and this desk endures heavy use. 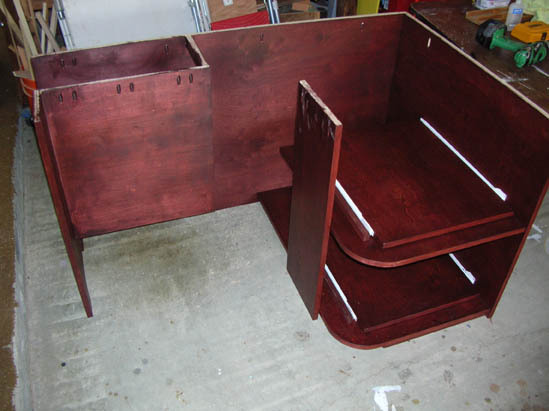 Feel free to contact us if you need more information about this corner desk project.